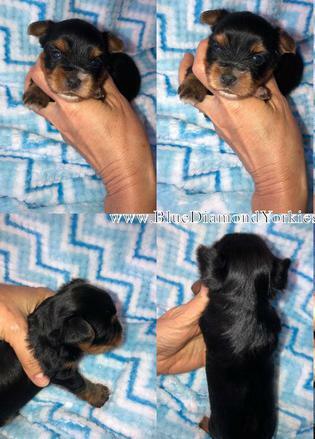 yorkie, yorkies, yorkshire terriers, yorkshire terriers for sale, yorkshire terrier, yorkie puppies, yorkie puppy, yorkies for sale, tiny yorkies, tiny yorkshire terriers, mini yorkies, mini yorkshire terriers, teacup yorkies, teacup yorkshire terriers for sale, akc yorkies, akc yorkshire terriers, akc yorkie breeders, yorkie breeder, yorkshire terrier breeders, new york yorkies, new york yorkshire terriers, shipping a yorkie, maine yorkies, new york yorkie, pennsylvania yorkies, colorado yorkies, illinios yorkies, indiana yorkies, tennessee yorkies, maine yorkies, florida yorkies, oregon yorkies, california yorkies, virginia yorkies, kentucky yorkies, washington yorkies, idaho yorkies, ohio yorkies, michigan yorkies, new jersey yorkshire terrier, west virginia yorkshire tyorkie, yorkies, yorkshire terriers, yorkshire terriers for sale, yorkshire terrier, yorkie puppies, yorkie puppy, yorkies for sale, tiny yorkies, tiny yorkshire terriers, mini yorkies, mini yorkshire terriers, teacup yorkies, teacup yorkshire terriers for sale, akc yorkies, akc yorkshire terriers, akc yorkie breeders, yorkie breeder, yorkshire terrier breeders, new york yorkies, new york yorkshire terriers, shipping a yorkie, maine yorkies, new york yorkie, pennsylvania yorkies, colorado yorkies, illinios yorkies, indiana yorkies, tennessee yorkies, maine yorkies, florida yorkies, oregon yorkies, california yorkies, virginia yorkies, kentucky yorkies, washington yorkies, idaho yorkies, ohio yorkies, michigan yorkies, new jersey yorkshire terrier, west virginia yorkshire terriers, south dakota yorkshire terriers, north dakota yorkshire terriers, yorkie studs, yorkie stud, yorkie dams, akc, ytca, grooming a yorkie, yorkie health, yorkie champions.erriers, south dakota yorkshire terriers, north dakota yorkshire terriers, yorkie studs, yorkie stud, yorkie dams, akc, ytca, grooming a yorkie, yorkie health, yorkie champions. 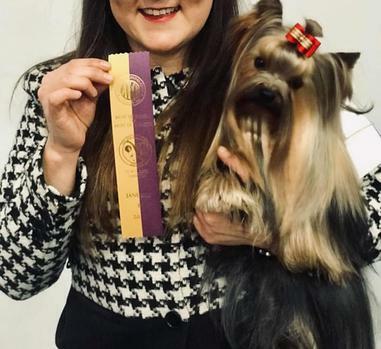 "Specializing in high quality Yorkies from Champion Bloodlines. The terms miniature,tiny, teacup, tea cup etc. 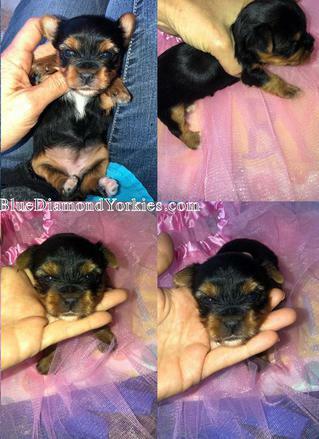 are only adjectives describing the size of the yorkies and arenot intended to imply that this is a new breed of yorkie." There is only one yorkie breed. 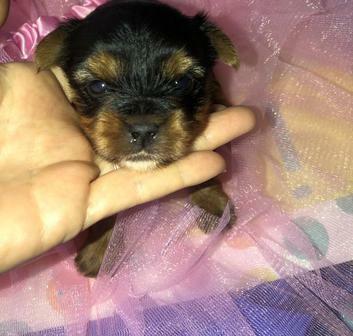 You will be picking up your yorkie puppy in Jacksonville, Florida unless you require shipping. Shipping is an additional $350 to your nearest major airport -US only! We have shipped over a decade with no issues. I handle the process for you. It is temperature regulated through the pet safe programs on the airlines. I also don't mind meeting up to an hour outside of Jacksonville when it is time for pick up. 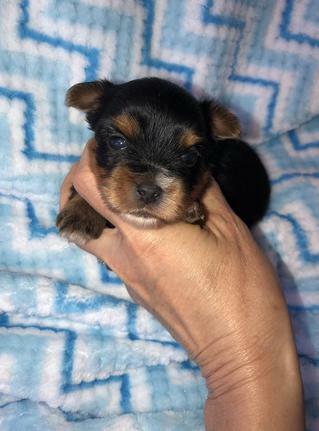 Hand delivery via one of my puppy nanny's (they fly with the puppy is $450) Our siring adults are 100% DNA tested so you know you are getting a purebred healthy and BEAUTIFUL purposely bred yorkie baby! This little boy has a deposit and is no longer available. This tiny little boy is currently charting to be 2.5-3 lbs. He is 15 oz at 9 weeks of age. He has never had to have nutri-cal and is doing great. He was so teeny tiny I couldn't stand to have his tail docked so he has his adorable tiny tail not to mention being born so tiny we weren't sure he would make it. So basically I couldn't bring myself to dock it and I'm so glad because it is so precious to see his little tail wag! . He will NOT leave my care until older due to his tiny size. Telling me you are used to raising tinies will NOT change my mind. He will come with a puppy pack, his blanket, AKC registration and health certificate. Deposit to hold him until ready and is non-refundable but is transferrable to another puppy. Keep in mind I rarely have puppies this size so make sure you are 200% positive.!!!!!. ** Now BEFORE you even remotely think about taking on a baby this small please read all the information I have posted below his video. Am I trying to deter most people? ABSOLUTELY. A few people have been so careless in the past of my tinies it makes me ill. If you do not have 1st hand experience with raising a tiny (and I do NOT mean an adult tiny! I mean raising one from the start!) then this isn't the puppy for you. I'm tired of people treating the teeny tinies like a large sturdy dog. 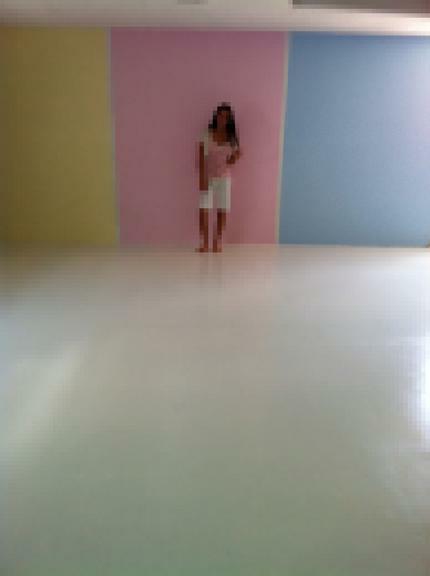 You need to know what is entailed with caring for a tiny. This is NOT a toy that you wind up and just let go. This is like having a fragile infant!! Seriously do not inquire if you have small children and have never raised a tiny like this! 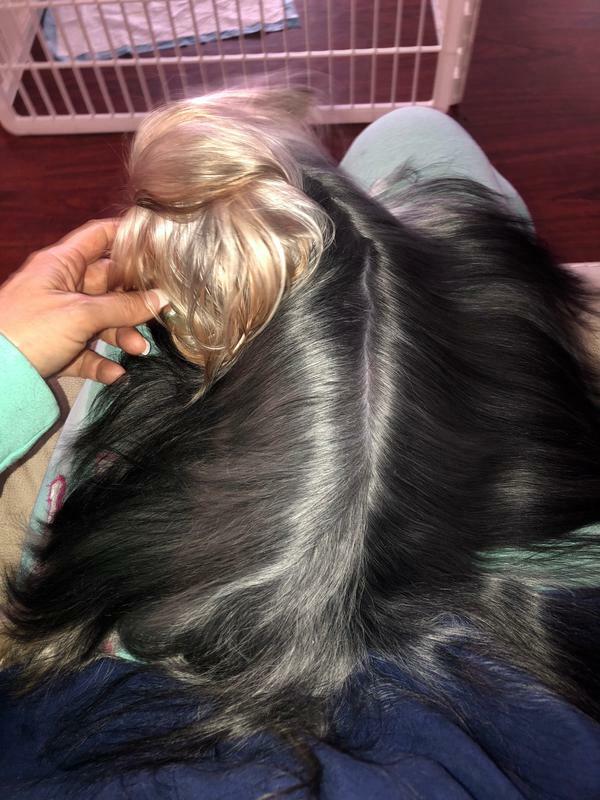 I have larger yorkies if you are an inexperienced yorkie owner. I have not given him a bath yet obviously because it is just not a necessity right now, but wow is he going to be extra amazing with a bath and blow dry. Also he may NOT leave my care before 16 weeks. It doesn't matter even if you have raised a tiny. If you don't have the patience for that then I promise this is not the puppy for you. A "tiny" shouldn't needlessly die at the hands of an inexperienced person pretending like they are experienced. I've put my trust in just a few wrong people with my tinies in the 18 years I've been breeding. Don't tell me you know how to take care of a tiny if you really don't. It's not fair to the puppy. If your child drops the puppy it can cause internal bleeding (Yes this happened and she tried to get another puppy, but I had already called her vet and found out the puppy had internal bleeding that could only be caused by dropping her!! Everyone loves to blame someone else as long as they don’t have to take responsibility for themselves!) . Size is NEVER guaranteed. Do you know what hypoglycemia is? Do you know how to keep their sugar levels up? Do you know to treat the puppy like fine china? Do you know not to have your children carry around these tiny babies? Do you know these aren't purse decorations? Do you know never to mop with anything ending in "sol" as they can lick their feet and ingest poison? Do you know how to keep a tiny hydrated? Do you know how to check their gums for dehydration? Do you know how to monitor their food properly? Do you know how to syringe feed if necessary? Do you know what to feed them if they won't eat? Do you know NOT to wait to take a puppy to the ER while you wonder for two days why he/she won't eat? See what I mean? Are you away from him the majority of the time? You don't get to blame others. You get to take full responsibility for your choice in committing to a tiny puppy that requires your undivided attention. I know it's sad that I have to write this stuff but it's seems to be necessary . You'll also be reading a flyer on hypoglycemia (which is so dang easy to prevent!!!!) in my presence and signing that you have read it. Also did you happen to know that even food can cause them to choke and die if you give them large kibble. KEEP them on what I give YOU!! Do not switch them just because YOU want them to be on something different. 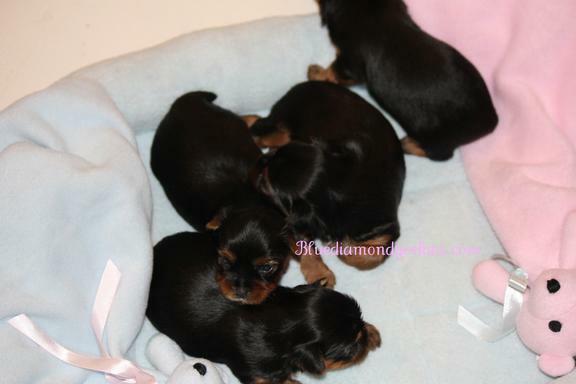 Unfortunately, I have to take the time to label all of them with my website because people seem to just love my pictures :) Some one even tried to create their own blue diamond yorkies page (located elsewhere) so they could use my pictures. This is why I put located in Florida on my index page and that you will only receive emails from bluediamondyorkies@yahoo.com although my PayPal does have a different address with my name on it. I also put my website across my pics now instead of just blue diamond yorkies. The cribs have plexiglass inserts so the infant babies fall out. Play pens are NOT safe for infants (if you are a breeder). I add this to the scoffers that say a puppy can't stay in a crib. That was my first one done. I had them all eventually custom made for my cribs. 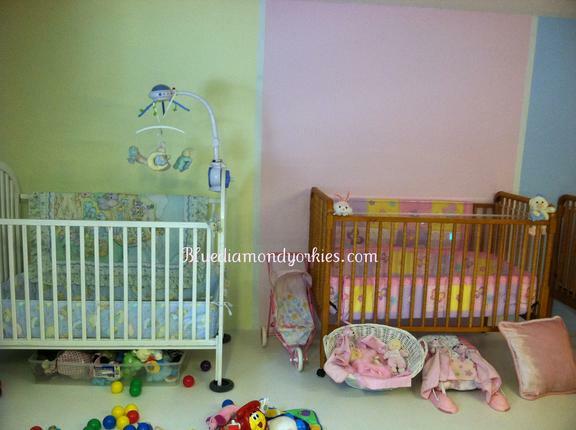 Zoom in on the pink crib !!! Yes-yes they can :-) Mind you- I did all this BEFORE I was blessed with grandchildren. This is something I did more so for myself than the puppies. They don't really care. I however, like visually appealing with neat, clean, and organized to top it off. 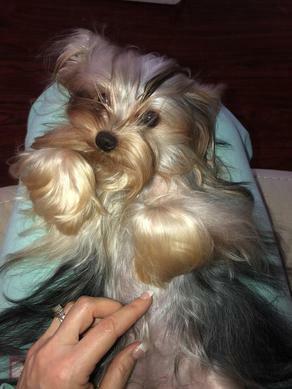 $2500 FEMALE 2 - CHARTING AN ESTIMATED 5.5-6 LBS AS AN ADULT. DEPOSIT WILL HOLD UNTIL THE END OF MAY WHEN SHE WILL BE READY TO LEAVE WITH HER VET CERTIFICATE AND FULL AKC REGISTRATION. $1800 MALE CHARTING AN ESTIMATED 5.5 LBS AS AN ADULT. DEPOSIT WILL HOLD UNTIL THE END OF MAY WHEN HE WILL BE READY TO LEAVE WITH HIS VET CERTIFICATE AND FULL AKC REGISTRATION. $2500 FEMALE 1 - 4 photos below . CHARTING AN ESTIMATED 4.5 LBS AS AN ADULT. DEPOSIT WILL HOLD UNTIL THE END OF MAY WHEN SHE WILL BE READY TO LEAVE WITH HER VET CERTIFICATE AND FULL AKC REGISTRATION. Champion Sired small female. She is 1 1/2 years old. This little girl is ready to go. Dad is a champion. 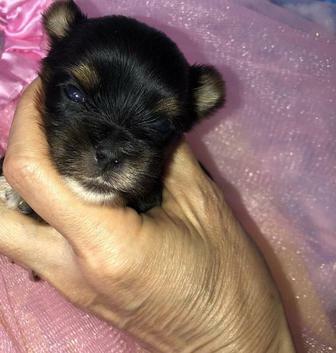 She is 3.14 lbs and will probably be too small for breeding. 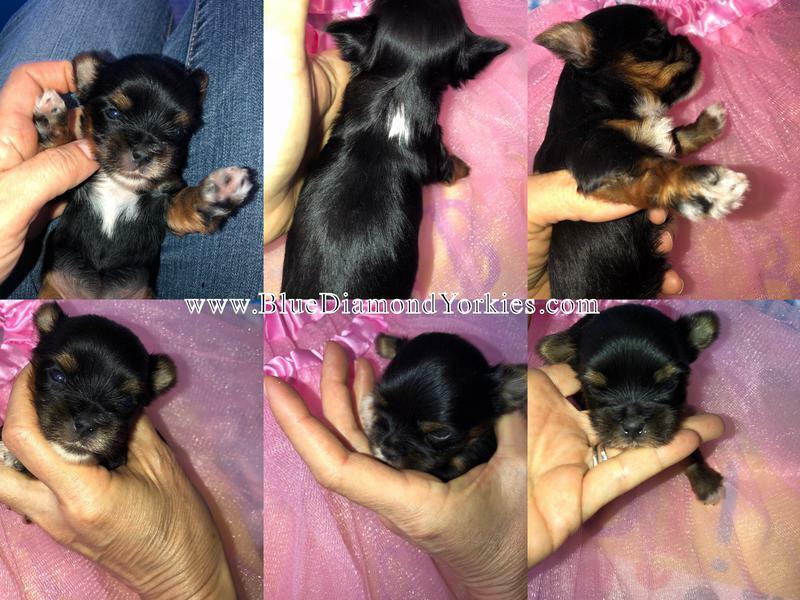 She will come with full AKC as I’ve already registered her. She goes on pee pads and is a super sweet lap baby. 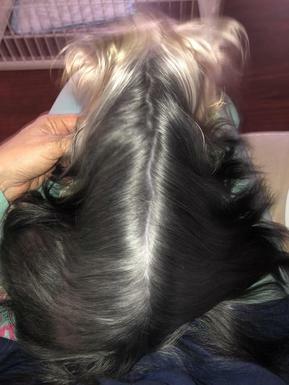 She is currently in summer cut from a few months ago but has a stunning silk coat . Pictures are her in long coat, her CH sire, and below that I have taken pictures with my T6 Canon and cell phone so you can see how different lighting is and placed in a collage of her current amature cut. I took those today 4/24/19 Still beautiful. Price includes delivery. 2800. Her health certificate was perfect. Heart worm negative. Rabies and shots /worming all up to date and certified by the vet. Payment will Zelle app, Apple Pay or cash (if local ) is fine. If local she would be 2500 . You may also fly into JAX (Jacksonville Fl ) airport to pick her up as well. She is great with kids, totally fine with other dogs, and sweet as they come. She loves nothing more than to fall asleep on your lap while you pet her belly softly. Meet little Nikki Mouse. See video for her disposition. https://www.youtube.com/watch?v=CwBbiqRQERA Email at bluediamondyorkies@yahoo.com if seriously interested in her.